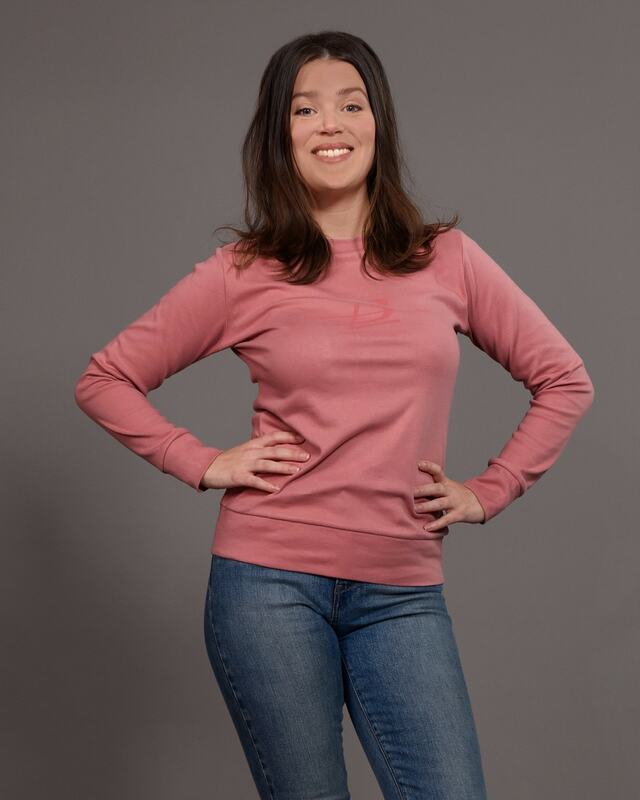 Comfortable organic college sweater with an environmental printing. Organic long sleeve sweater – Lela is made similar as a classical college sweater. The fabric we used is organic interlock jersey. 100 % organic cotton. You can read more about jersey and interlock jersey here. Our model Andrea is 163 cm and wears size small. The fitting is loose fit. 100% organic certified cotton. Our chest printing is made with an environmental technique. This technique is called pigmentation. It contains no plastics or harmful chemicals. The result is a printing that will stay for a very long time without fading. When you buy this sweater you contribute to a better clothing industry. We also climate compensates for our transportation. We used 100 % organic interlock jersey for Lela. Raw material origin and manufacturing origin is India. Not far from our manufacturer the organic cotton grows. The GOTS and Fair Trade certifications assures that working conditions and environmental issues are taken good care of. First of all, cotton is easy to wash. Machine wash the Organic long sleeve sweater – Lela at 40° or if particularly dirty you can use 60°. You should also avoid tumble drying. Wash with similar colors and use only organic washing powder. By this way you limit the emission.